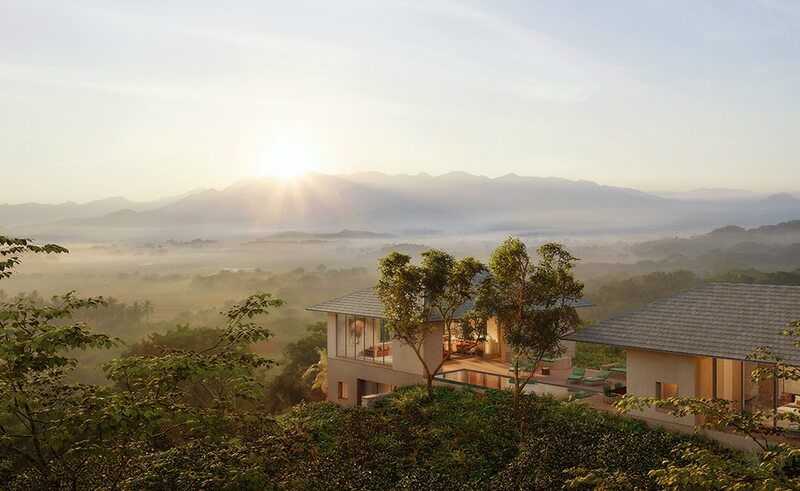 This contemporary five-bedroom villa is one of 55 luxury homes being built at the new One&Only Mandarina residential resort on the central Pacific coast of Mexico, north of Puerto Vallarta. “If you’re in the pool, you see the entire coastline, and you’re looking down over a one-mile stretch of beach,” he said. “From Villa 6, you are able to take in all of the different ecosystems that the property has to offer,” Mr. Santa Cruz said, including mountains, jungle and rainforest, sandy beaches, green flatlands and estuaries. RLH Properties is the developer of Mandarina, and Mr. Santa Cruz’s company, RSC, is handling all of the sales and marketing. Architect Rick Joy is designing all 55 villas and each is architecturally unique and envisioned specifically for its location and to capture the best ocean views. “I love that when you’re standing in your kitchen, you can look out and see mountain, valley and beach views,” said Kappner Clark, director of marketing and sales at RSC. “I was there when we were doing the renderings and it was one of the most spectacular sunrises I’ve ever seen, with the sun coming through the haze of the mountains,” she added. A 108-room One&Only hotel on the 630-acre site will also be finished by the end of 2019, he said. The development will eventually include a second hotel and another group of branded homes, to be operated by Rosewood Hotels & Resorts Inc.
Villa 6 also sits above the polo fields and equestrian center that will be a prime feature of the resort. Outdoor spaces include an infinity-edged pool, terrace and garden areas. There are three themes of furniture packages that buyers can choose from and purchase, and then they can put the furnished villa into the resort’s rental program. The 6,684 -square-foot, one-level villa has five bedrooms, five full bathrooms and one partial bath. There is another 2,530 square feet of exterior space. Amenities include the One&Only Majahua Beach Club, with beachside terraces, dining, massage spaces and a jetty extending over the sea that will create a harbor and haven for swimmers; the Mandarina Polo and Equestrian Club, with a clubhouse, arenas, two tournament-size polo fields, polo lounge, pro shop, horse boarding and veterinary clinic; One&Only Spa; Canalan Beach Club along Mandarina’s one-mile stretch of soft-sand beach; a farm that will produce for a farm-to-table restaurant; and trails for hiking, biking and horseback riding. Mandarina is about 15 minutes north of the village of Sayulita, which is known for its charming cobbled streets and great surfing, Mr. Santa Cruz said. It’s just under an hour’s drive to the Puerto Vallarta International Airport, he said, and a new highway due in 2019 or 2020 will make it a 30-minute drive.